After the Triathlon one month ago, the Notre Dame de Jamhou r College has organized the yearly NDJ's Cross Country Championship for schools, on January 18, 2014. Fourteen different schools and 351 athletes participated in this local championship. In the Kids Category (10-11 years), Farah Tayar (CSJ), the young sister of Manal Tayar who was one of the strongest middle distance and cross country runner, won the race with a big margin. Her brother, Wajih Tayar was also one of the favorites in the Boys category, but was absent for this championship. We can say that the Tayar's family is a family of great runners! In the Boys, Hamza Seblini from LES Tyr won the race in 5 minutes 27 seconds, leaving after him Mario Ghorayeb from NDJ and Ralph Moujaes (Champville) who fought hard in the last 10 meters to win the 3rd place over Kevin Aoun (NDJ). 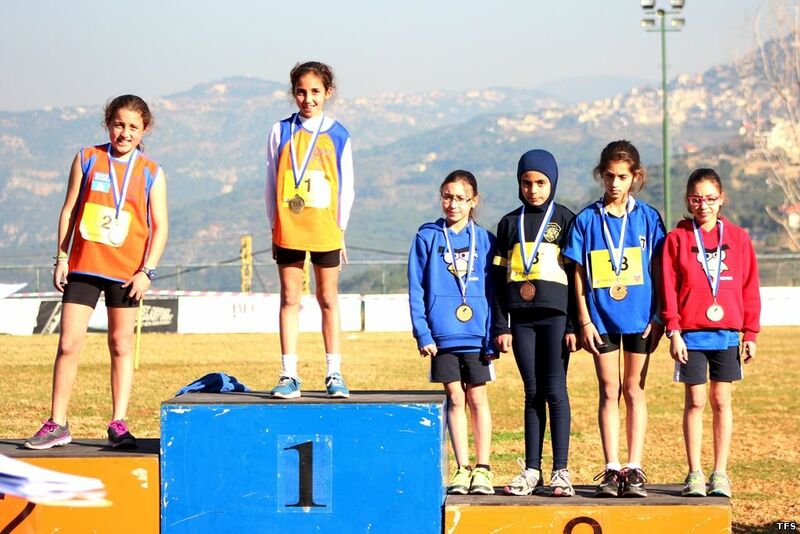 In the Bantams (12-13 years), Tara El Khazen (NDJ) won the girls' race, and Samir Abi Najem (Champville) won the boys' with a long last sprinting towards the finish line, so surpass Kevin Zoghbi from Antonins and Rudy Feghali (NDJ). The Antonins boys took the first place while Champville and Jamhour finished in 2nd and 3rd place respectively. The Midgets Category (14-15years) was an exciting one, with Ghiya Mtayrek (Cadmous Tyr), who won the Girls race with 7 minutes 47 seconds in front of Yasmina Fakhry from NDJ who wasn't far behind Ghiya with 7 minutes 54 seconds. It isn't the first time that the names of Ghiya and Yasmina appear in Track and Field; they have now a full background behind them, in the Beirut Marathon and the Track and Field Championships. We look forward to see them perform even better in the next Category Championship. Peter Khoury (Champville) and Elie Farhat (NDJ) battled for the title from the beginning of the race to its end. Elie Farhat was following Peter from the start and overtook him in the last 50 meters with an amazing sprint. Elie finished first with 9 minutes 31 seconds and behind him, Peter with 9 minutes 34 seconds. Finally, the Youth Category (16-17 years), with Lynn Doughane (NDJ) on the highest step of the podium with 9 minutes 20 seconds, and Christelle Doueihy (Champville) second with 9 minutes 43 seconds. Cadmous Tyr won the first 3 places with Elias Makhoul (Cadmous Tyr), who is also very well known in middle distance races, first with 12 minutes 33 seconds, Ali Kassab seconds with 12:40 and Mohamad Fawaz 3rd with 12:42 seconds. NDJ won 5 over 8 team podiums, Champville and Cadmous Tyr were a very competitive team and individuals, and Antonins had great boys’ runners. This cross country was like a test before the Cross Country Lebanese Championship. Until then, athletes will all prepare hard to appear on the top of the podium!